Create With Me: Eileen Hull Sizzix dies for Halloween and Thanksgiving! 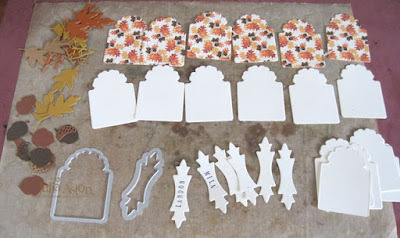 Eileen Hull Sizzix dies for Halloween and Thanksgiving! 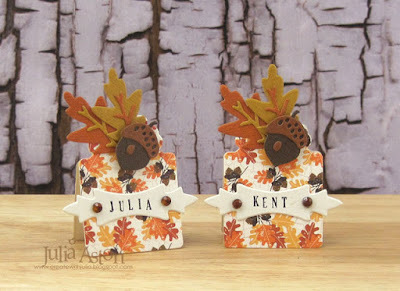 This month Eileen Hull's Inspiration Team is creating fall projects using various Sizzix dies designed by Eileen. to make treat bag toppers for Halloween. 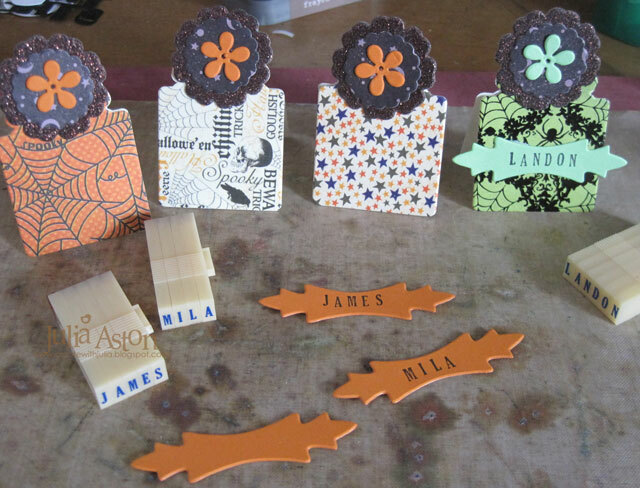 and name place cards for Thanksgiving! The place cards measure 2 3/4" tall to the top of the leaf and 2 1/4" wide including the point on the name labels - so they are sweet and petite! 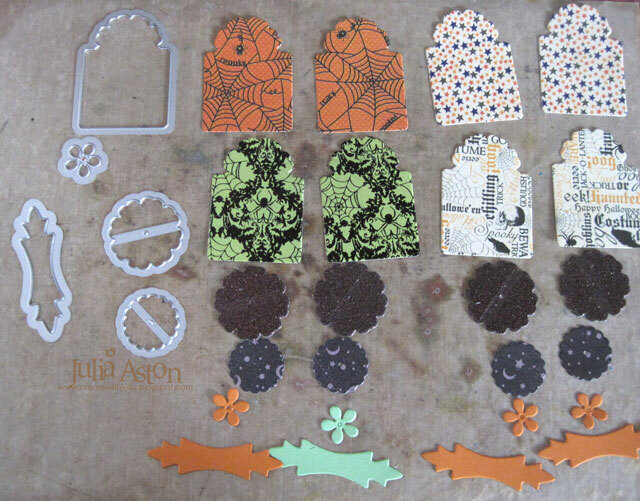 For the Halloween Treat Bag Toppers - I cut out all the pieces from patterned papers. 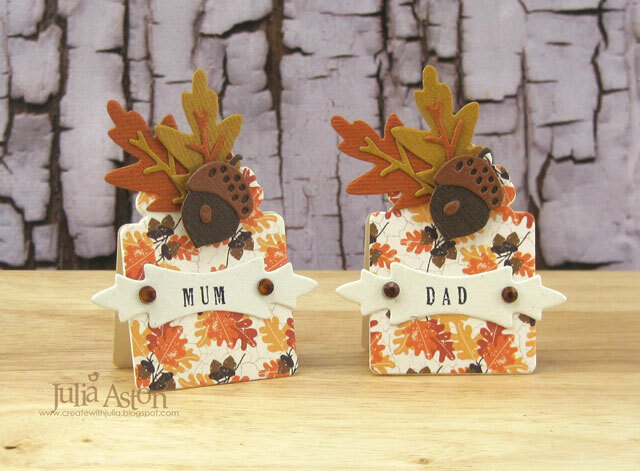 I used the pattern paper for both front and back of these. These papers are thick so they are sturdy without having to layer them to card stock. The labels and smallest flowers are die cut fro card stock. I adhered the flower pieces together (the largest one is cut from purple/black glitter paper so it's shiny IRL!) 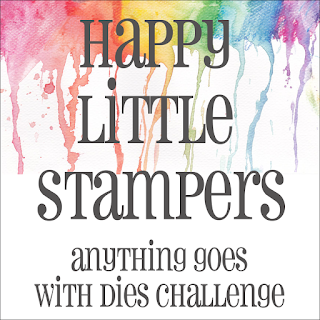 I stamped the names on the labels (these are Karen Foster Alphabet snap stamps - no longer available). I glued the backs to the fronts just at the top rounded area. I added an orange rhinestone to the center of each flower. I filled the bags (from a Stampin'Up monthly project box - gifted to me by my blogging friend Mary as she wasn't going to use them, thank you Mary!) with Hershey Kisses, folded down the bags and sealed them with a piece of tape. Then I put ScorTape along the bottom edge of the front and back of the 'toppers' and adhered them to the bags. Those are tiny spiders on the clear bags! really yucky spooky! I added a skeleton sticker to the boys bags and a Halloween Kitty to the girls bags (both from Michaels). They are glittery as well. 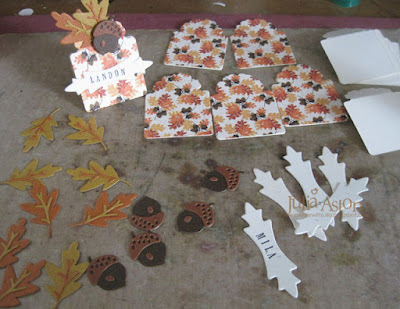 It was pretty much the same process for the Thanksgiving Place Cards. This patterned paper from PTI was thinner and I only used the pattern on the front so I cut 6 out of the patterned paper and 12 out of Vintage Cream card and adhered the patterned paper to the Vintage Cream for sturdiness. I used Tim Holtz/Sizzix Funky Foliage set for the leaves and acorns which I die cut out of Coredinations Kraft Core Nostalgic Collection papers. I scored along the inside of the back pieces so they would bend nicely to stand up when I adhered the top section of the fronts to the backs . I adhered the acorn pieces together as well as the leaves and veins gluing them to the top of the fronts. The acorns are popped up on a foam dot. 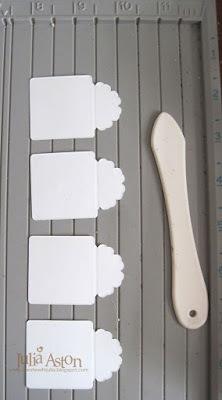 I glued the fronts to the backs just along the top above the score lines and added the name tags to the front. I adhered orange rhinestones on each side of the names for a little sparkle. So that's it! A creative way to use Eileen's Bookmark and Bookplate dies! I hope you have been inspired by my projects today! Please check out Eileen's blog for the month of October where she will gather all of the teams projects and post them weekly on her blog! 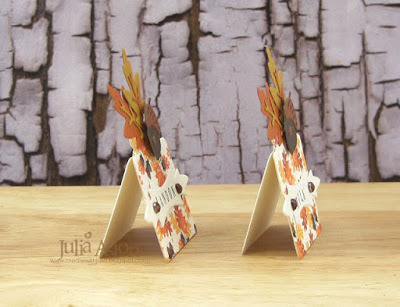 Lots of fall inspiration for you!! 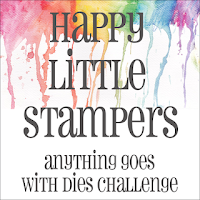 Stamps: Karen Foster Snap Alphabet Stamps - no longer available. 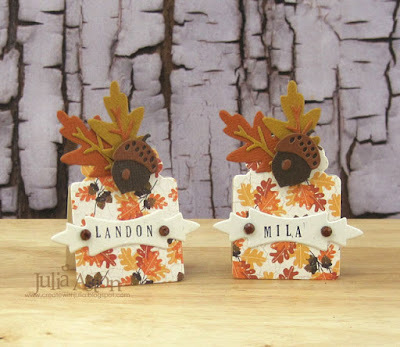 Paper: Orange Zest, Vintage Jadeite, Vintage Cream, Rustic Cream, Text Style Autumn Abundance - PTI, Core-dinations Kraft Core Nostalgic Collection, Glitter Paper - Michaels, Moonlit Manor Paper Pad - Michaels, Ghosts & Goblins Mat Stack - DCWV. 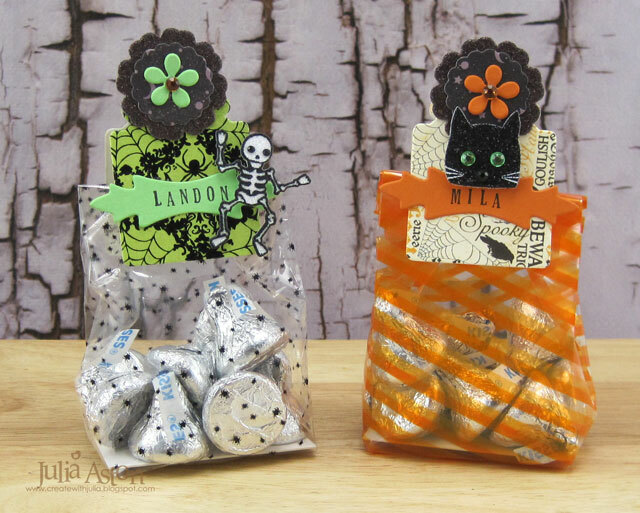 Accessories: Bookmark Tag and Pocket Dies, Bookplate Hinges and Label Dies - Eileen Hull/Sizzix, Funky Foliage Thinlits - Tim Holtz/Sizzix, candy bags - SU October kit, Skeleton and Cat Glitter Embellishments - Michaels, rhinestones - Kaiser Craft, ScorTape, Tombow Glue. How wicked cute!! These are very fun and will be a graveyard hit!! 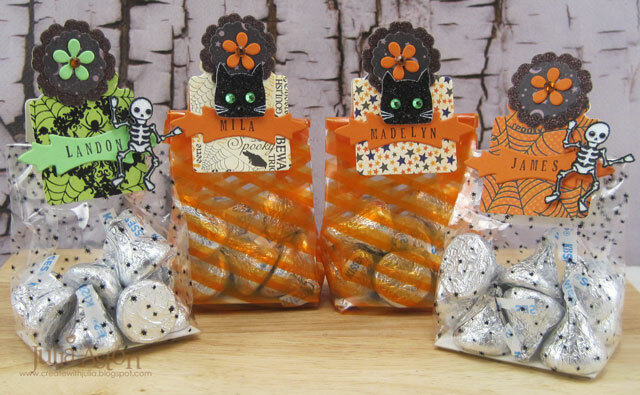 These are great little treat bag toppers! My goodness, you have been busy! Hugs! 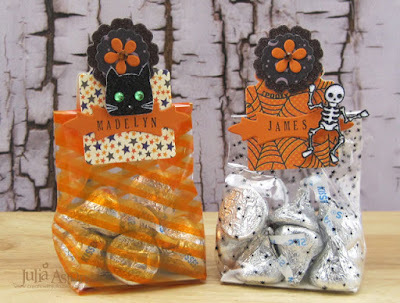 Fun treat bags, Julia! I'm sure they will be a hit for Halloween and Thanksgiving! Such fun for the kids and their parents. So festive for the Thanksgiving table too! These are just the cutest treat bag toppers! Love both the Halloween and Thanksgiving themes! 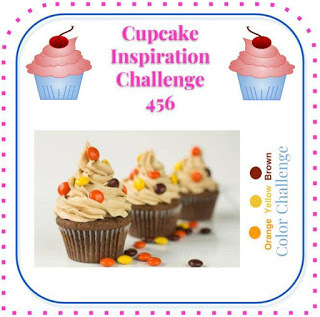 Thanks so much for sharing with us at Cupcake Inspirations! Spooky crafts from the past!! !